As well as outstanding vocal harmonies, The Traceys also proudly feature the stellar harmonica playing and soulful singing of Michael Tracey. After several years of performing, Michael took a break, returning to the stage just three years ago. Since his return, Michael has been crowned 2007 Northwest Harmonica Champion, has been a featured performer at the Portland Waterfront Blues Festival, and performed at the Willamette Valley Music Festival at the Cuthbert Amphitheater as one of the winners of the New Singer/Songwriter Contest. Michael was also recently awarded the Best Male Blues Vocalist at the blues awards ceremony held by The Rainy Day Blues Society in Eugene. 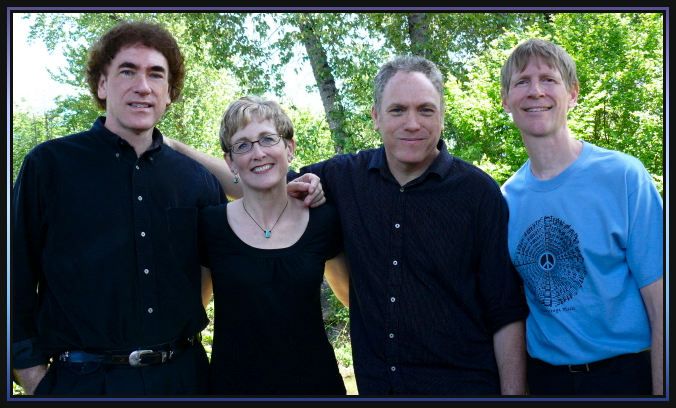 In addition, The Traceys include the fine singing and percussion of Annie Tracey, Larry Tracey on guitar and vocals, and Steven Myers on bass and vocals. Michael Tracey found his first harmonica at the age of 12 while searching through a box of his big brother Larry’s prized possesions. Although it was a broken down old Marine Band, once he picked it up, he couldn’t put it down. He taught himself to play and sing listening to the legendary Blues programs broadcast on the Public Radio Stations in his hometown of Eugene, Oregon. In 1989, he and his bother Larry formed The Traceys, and he performed with them and several other bands in venues and festivals up and down the west coast before deciding to take a break from music to get a “serious” day job. After nine long years away from doing what his heart and soul were made to do, however, Michael started performing again in 2007; and it didn’t take long for him to pick up where he’d left off. Since his return to the music scene, he has been crowned Northwest Harmonica Champion, and has been a featured performer at the Portland Waterfront Blues Festival. In addition, one of the songs he wrote won first place in the Singer/Songwriter contest at the Willamette Valley Music Festival. Although Michael is an accomplished songwriter who has also been described as one of the best harmonica players ever to come out of the state of Oregon, he has consciously and diligently worked towards developing a vocal style which is extremely powerful and soulful. Recently, Michael received an honor which is more precious to him than any of others he has received when he was voted Best Male Blues Vocalist at The Rainy Day Blues Society Rooster Awards in Eugene. Annie Tracey was born in Baltimore, Maryland and grew up in Tulsa, Oklahoma. As a girl, her influences included Simon and Garfunkel, James Taylor, Emmylou Harris, and Joni Mitchell. The daughter of an accomplished Dixieland jazz band player, Annie began her musical career singing in her church choir at age 8. She grew up loving to sing so much that she eventually studied vocal performance at Cornell College. She moved to Eugene in the late 70s to attend the University of Oregon, and joined The Traceys soon after the group formed in the late 80s. In addition to performing with The Traceys, Annie performs with the Eugene Concert Choir and has acted regularly in Eugene musical theater productions for the past 20 years. Her stellar voice is the foundation of The Tracey’s outstanding vocal blend. Annie Tracey has a singing style that has been described as having the ability to “melt the hearts” of those who listen. Larry Tracey was born in Eugene and has been playing guitar and singing in the Eugene area for over 30 years. He started playing the guitar in high school and went on to perform with several electric and acoustic bands throughout the Willamette Valley. Eventually, his love of acoustic music and tight harmony singing won out, and that’s what he’s been doing for the last several years. Although he has performed with some of the finest musicians and bands in Eugene, Larry says that there is nothing that can compare with the musical experience he gets sharing the stage with his brother Michael. Larry’s rhythmic style of acoustic guitar playing, excellent singing, and wonderful song writing help to serve as the foundation of the sound that makes The Traceys one of the finest acoustic bands around. Steven Myers is the excellent bass guitar player and the most recent addition to The Traceys. Originally from Santa Barbara, California, Steven was raised on surf music and rock & roll. He first picked up a bass guitar at age 15, and it was instant chemistry ! He's performed on guitar and bass with many well known Eugene area musicians over the years including guitar legend Mondti Amundson (Big Monti), John Powell (The Valley Boys), Meridith Brooks, and the band Scandal. Steven says he "loves providing the foundation and the glue for the Traceys’ music...That's what playing the bass guitar is all about.” In addition, his infectious energy on stage make Steven a joy to watch as well as to listen to.